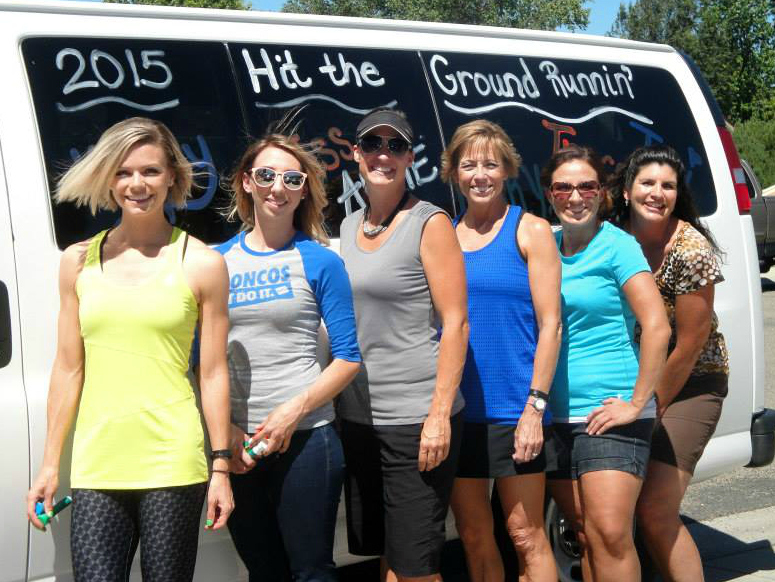 This past weekend, I joined the ladies of "Hit the Ground Runnin'" as we relayed 62-miles across the Idaho mountains at the Sawtooth Relay. Oh man, we had a good time. The weather was perfect, we had a great start time of 5:45 am, the teams around us were a blast-and-a-half, and it was just an overall kick-in-the-pants good time. I had last ran Sawtooth in 2013 (I missed last year due to being away at Basic Training) and was excited to be back for another year. We all met on Friday afternoon and loaded up the "Beast" (a.k.a. our rental van) before trekking up the mountain. We arrived at the cabin in Stanley around 7:00 pm and enjoyed a dinner of chicken, pasta and kale salad—a perfect pre-race carb-loading meal. While we were lucky to get a good start time of 5:45 am (teams start as early as 1:00 am), we still wanted to call it an early night and turned in around 10:00 pm. The alarms began going off the next morning at 4:00 am and we were loading up the van and heading to the start line by 5:00. My mom started our team off with the first leg and each of our runners did awesome. We stopped and cheered them on every couple miles and enjoyed the camaraderie with the other teams—especially "Stay Classic" and "Team Spirit's" mariachi band! 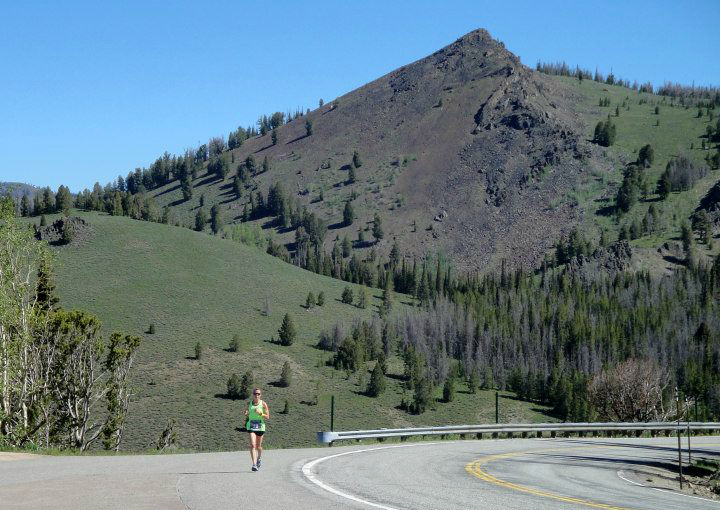 I ticked away the racers, legs and hours until I was up to run the 6th leg—the dreaded Galena Summit. When I had last run Sawtooth, I had legs 2 and 8 and jokingly said, "I'll take Galena next time!" ... Little did I know they'd take me up on the offer! Since I hadn't trained hills at all due to training super-hard for my most recent half marathon, I was a little nervous about tackling the uphill leg, but it ended up being OK! The first mile of my 5.35-mile leg was a little too fast, and I slowed down a little between miles 2-3. However, as soon as I turned the corner of the Galena Summit overlook and could see the huge mountain I had just climbed, the feeling was so empowering and I was able to pick up speed for my last couple miles. I ended up averaging about 8:22/mile, which is not my normal race pace, but gosh dangit it was all uphill and I was excited about that time! The heat set in as my mom headed down the mountain and everyone began picking up the pace to bring us to the home stretch. We started dancing more, cheered on everyone passed, and had such a blast. I ran the last 2.64-mile leg into the finish line chute, coming in with a pace of 6:10/mile, and we all crossed together with a final time of 9 hours, 25 minutes and 54 seconds. WE HAD DONE IT! We celebrated with the after-party feast and basked in the sun—stoked that it was over. After lots of story-telling and laughs, it was the end to a perfect day. And yes, it was only like 8:30 pm, but after being up for that long and running through the hot sun, all you need is a shower and it's lights out after that for us. We're such troopers, I tell you what. See some of the photos of the race below! 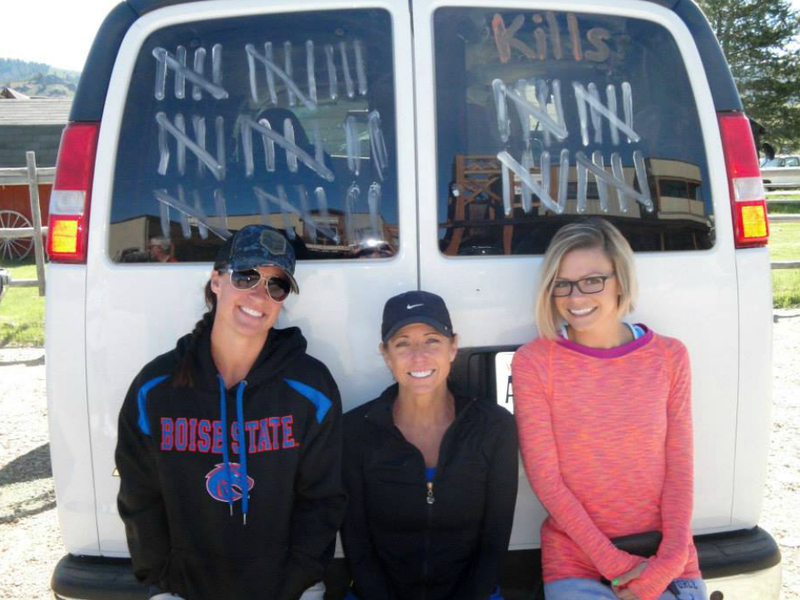 The team, minus one, decorating the van before heading up the mountain. Our signature "Hit the Ground Runnin'" team pose. Checking in at 5:15 am and getting ready to begin. My mom was all done up in her neon for her first leg start. Prepping for the hand-off! Here comes Jess! And I'm off! Heading up the mountain and jammin' out to my electronic dance music. Cruising up Galena Summit. I felt strong! My chant this race was, "One Foot! One Foot! ", which was the shortened version of "one foot in front of the other" in order to keep me going... though after all was said and done, I'd definitely run that leg again—it wasn't as bad as I thought it would be and the teams around us were so supportive, cheering me on the whole way! Cresting the top and passing the Galena Summit scenic overlook. This was where I started to pick up the pace! Handing off to my mom. She had the downhill 7th leg. Everyone thinks the summit is the hard leg—I disagree! My mom took one for the team by doing this leg. Cheering on my mom and she took off—she averaged 7:35/miles going down the hill. What a rockstar! 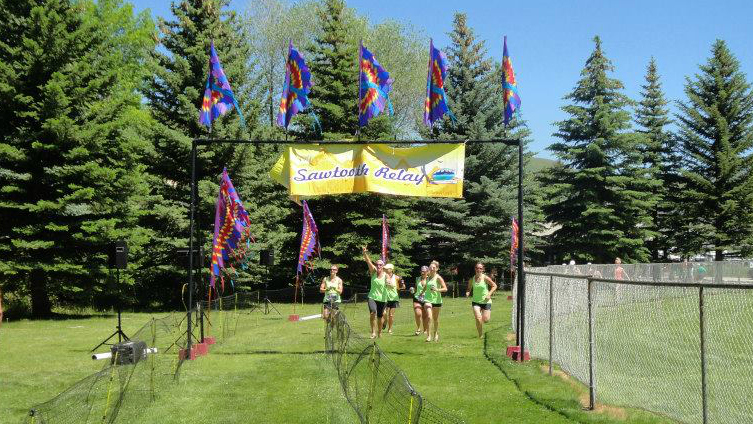 Coming down the finish line chute. We were there! Team Hit the Ground Runnin'... I love my team! Sitting proudly next to our "kills" before breakfast the next morning. We passed 57 teams during our race! Sawtooth this year was an absolute blast. 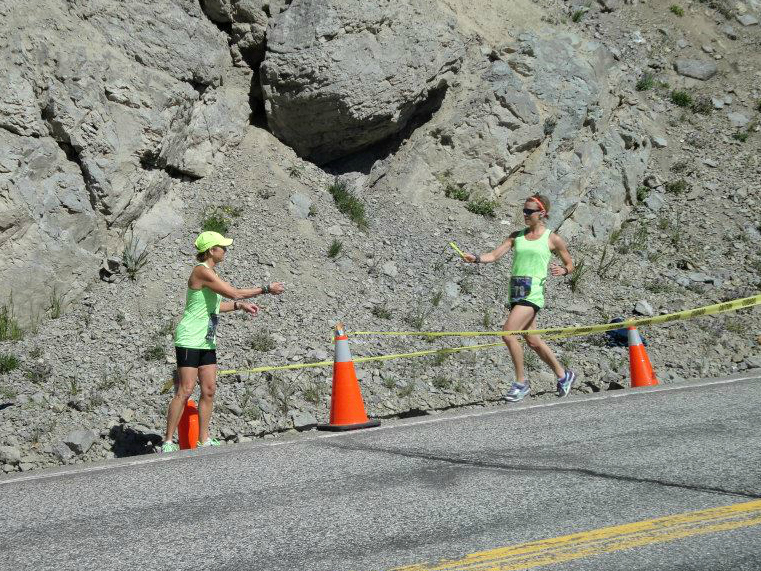 It's so fun going up to the mountains for a weekend with the ladies and joining so many people who love to run! We always come home with the best stories and memories that last a lifetime. 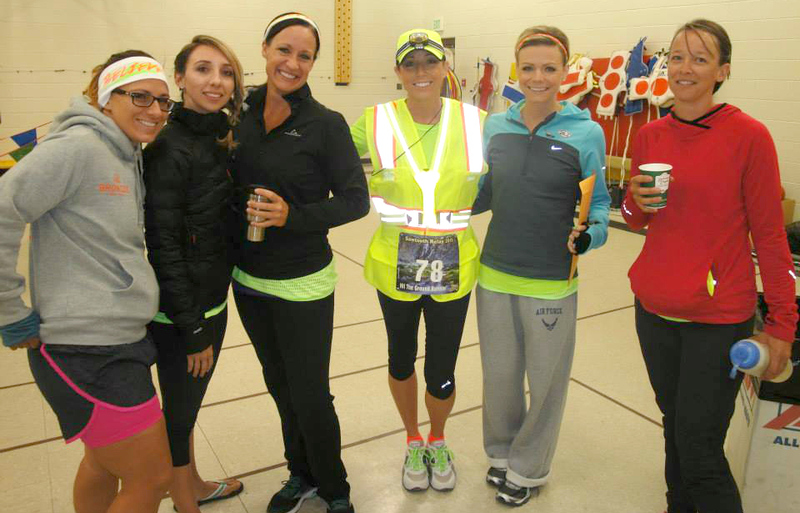 If you ever have a chance to gather a team together and run this race, don't miss it! See you next time, Sawtooth! Looks and sounds like you all had a great time! What a fun way to mix up running. The views must've been incredible!! !